Fig. 1. "Japanese Lantern" Protein MscS. Mechanosensitive channels are membrane proteins that open and close in response to mechanical forces produced by sound, gravity or osmotic pressure, among other mechanical stimuli. In the open state, these proteins allow passage of ions across the membrane, thus generating an ionic current that eventually becomes an electrical signal (mechanotransduction) or that simply helps, for instance, in the regulation of cell volume. In bacteria, a protein that looks like a Japanese lantern (formed by a transmembrane pore and a cytoplasmic "balloon" with seven small openings around its equator) apparently prevents cell burst upon osmotic shocks by controlling passage of water and ions in response to membrane tension. 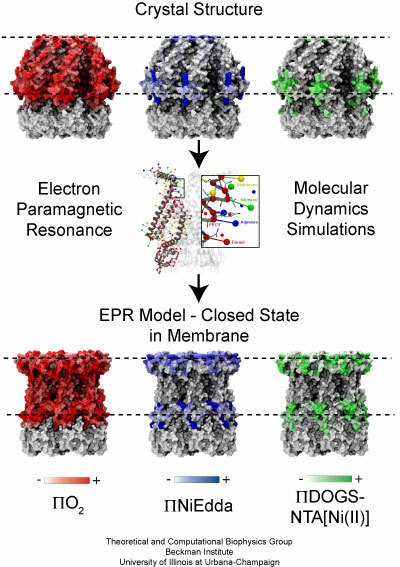 Mechanical channel gating and transport of ions through this Japanese lantern protein, called MscS, have been studied by combining different experimental and computational methodologies: patch-clamp experiments and electron paramagnetic resonance (EPR) measurements (Perozo's Lab), all-atom molecular dynamics simulations (using NAMD), a coarse-grained model (using BioMOCA, Ravaioli's Lab), and restrained molecular dynamics (Roux's Lab). The experiments revealed that MscS can be found in inactive, closed, or open conformations, while the MscS simulations (all-atom involving 220,000-atom systems lasting tens of nanoseconds and coarse-grained lasting 100 nanoseconds or more) suggest that the structure depicted by X-ray crystallography is not that of a completely open, non-selective channel. Finally, restrained molecular dynamics incorporating data from EPR experiments provided a model for the closed and open conformations of MscS in its native environment. MscS, with a conductance of 1 nanoSiemens and a slight anionic selectivity, is formed by seven identical subunits, as revealed by its first crystal structure (pdb code 1MXM/2OAU). The transmembrane domain has three alpha-helices per subunit, and the third helix is divided by a pronounced kink into two subunits. The transmembrane pore appears to be in an open state with a diameter of 6.5 Angstroms in its narrowest section. On the other hand, the cytoplasmic domain of MscS is formed by a large chamber or "balloon" thought to act as a molecular filter (but otherwise of unknown function), with seven openings on the sides and one at the bottom. The first MscS crystal structure, as described above, allows one to observe the channel at atomic resolution and to identify domains and residues relevant for its function. However, despite the availability of the structure, key questions remain unanswered: Does the structure explain the physiological role of MscS, i.e., is MscS only a safety valve? What residues are relevant for gating? Does the crystal structure show the fully open form of the channel? What is the role of the large (balloon shaped) cytoplasmic domain? Fig. 2. Mechanosensitive Channel of Small Conductance MscS. The left panel shows a top view of the transmembrane domain and pore of MscS (from the periplasm). Side view of transmembrane helices of MscS are shown in the center panel along with the proposed position of the membrane and the axis of the channel. A side view of the cytoplasmic "balloon" of MscS is shown in the right panel. Fig. 3. Simulated conformations of MscS. 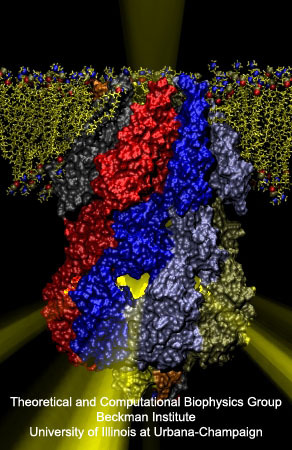 In order to determine if MscS is in its open state and how it transitions to a closed or "off" state ("gating"), several all-atom molecular dynamics simulations were performed on a system that included the whole crystal structure of MscS embedded in a lipid bilayer with water and salt (220,000 atoms!). 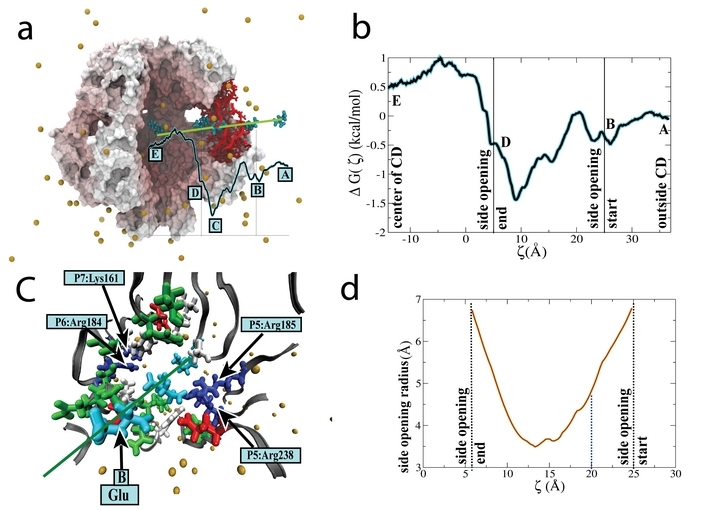 After a short equilibration with the protein backbone restrained to the crystal structure, a close packing of lipids against the protein was achieved (see panels A and B of Figure 3) favored by close interactions between lipid head groups and charged side chains of the protein. Despite restraining the backbone of the protein, the radius of the transmembrane pore in its narrowest part decreased, indicating a strong tendency of the channel to close in the membrane environment. The channel at native physiological conditions should be closed, preventing leakage of solutes and dissipation of the cellular potential. Simulations in which restraints on the backbone of the protein were eliminated allowed us to investigate if MscS does relax to a closed state in a membrane without tension. Indeed, gradual elimination of backbone restraints resulted in the spontaneous, asymmetric, closure of the transmembrane pore (see panel C of Fig. 3). Whether this occluded state represents a closed ("off"), collapsed ("out of service"), or inactive ("on vacation") state remains uncertain, but clearly MscS relaxes to a state in which ions cannot be transported. Fig. 4. Key interactions mediating structural rearrangements of MscS. Click here for a movie (mpeg, 3.9M) showing closure of MscS transmembrane pore. Click here for a movie (mpeg, 3.5M) showing widening of MscS transmembrane pore. Fig. 5. Left: Intermittent water permeation through the transmembrane pore of MscS. Right: Charged amino acids located at the cytoplasmic and periplasmic ends of MscS's transmembrane pore. How do we know if MscS is in its fully-open conformation? For this particular protein, the open state is characterized by conduction of ions accompanied by water. 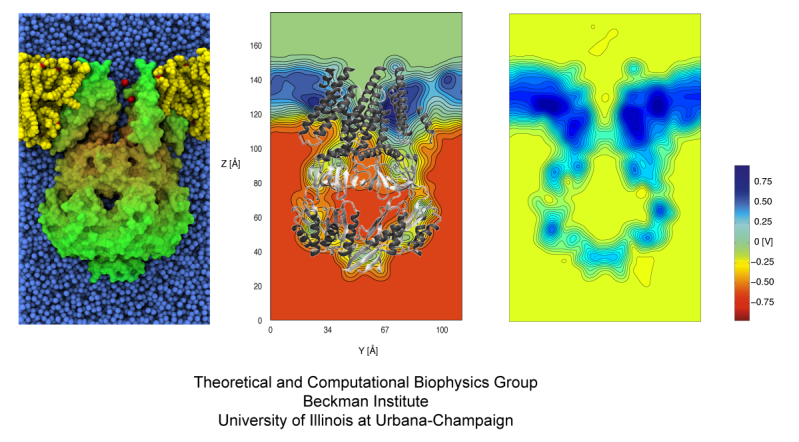 Therefore, the degree of water permeation gives an idea of how open or closed the conformations obtained through simulations are. 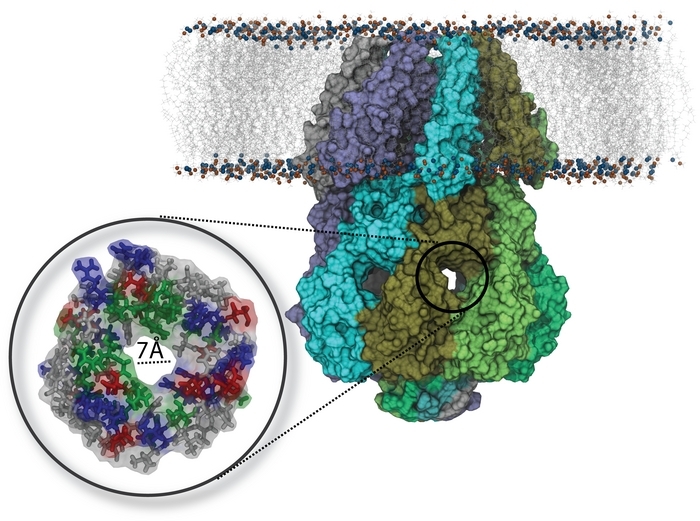 Surprisingly, two different states were observed when the protein was restrained to the crystal (1MXM/2OAU) conformation: the pore transited from being completely filled with water, to being partially empty. This dewetting transitions may be relevant for transport of ions, although they were not observed in wider conformations of the channel that exhibited enhanced transport of water (see Fig. 5). What about ions? Only spontaneous diffusion of charges should be observed when no electrostatic bias is applied (resulting in a zero net transport of charge across the channel). 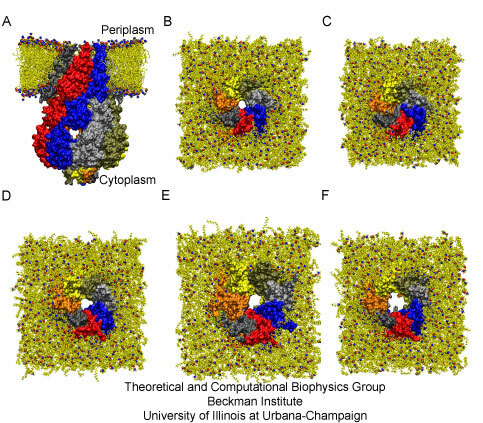 The simulations showed indeed spontaneous diffusion of ions across the cytoplasmic side openings of the "balloon", but not through the transmembrane domain. Moreover, a particular pattern for the distribution of ions was observed: chloride ions (negative) accumulated at the ends of the transmembrane pore, while potassium ions (positive) seemed to accumulate at the distal part (from the membrane) of the cytoplasmic "balloon". Since the time scale of these simulations was too short and no biasing voltage was applied, further simulations using a coarse-grained description were carried out to determine the degree of "openness" of different conformations. Click here for a movie (mpeg, 8.6M) showing permeation of water molecules through MscS. In order to explore transport of ions across MscS subject to a biasing electrostatic potential over long time scales (100 nanoseconds or more) we simplified the description of MscS and its environment and modeled the protein and lipids as fixed dielectric materials, while ions were explicitly simulated using an implicit solvent. The dynamics of the ions was described by the Boltzmann transport equation and determined by electrostatic fields computed using Poisson's equation. The ions were therefore slowly pushed across the channel and the degree of "openness" of different conformations of MscS were determined by counting how many ions crossed through the MscS. The simulations revealed that ions permeated MscS through side openings of the cytoplasmic domain ("balloon") rather than through the distal cytoplasmic opening of the balloon. 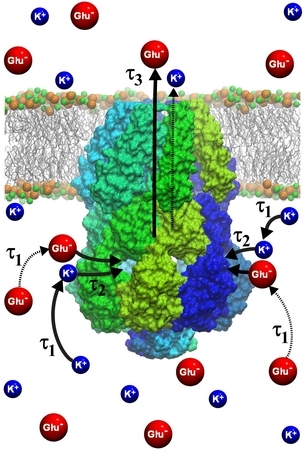 In addition, time-averaged electrostatic potential maps and ion densities featured a strong localized separation of chlorides and potassium ions inside and around the cytoplasmic domain and the transmembrane pore (see Fig. 6). Ionic currents computed for MscS conformations similar to those of the first MscS crystal structure were found to be too small to represent an open state, while currents computed for wider conformations reached through steered molecular dynamics simulations reproduce the experimentally determined values of the fully open channel. However, ionic currents were found to be mainly driven by chloride ions, indicating a high selectivity for anions over cations, in relative disagreement with present experimental results that suggest slight anionic selectivity. Fig. 6. Electrostatic potential, chloride and potassium concentrations along the MscS channel averaged over 100 nanoseconds of BioMOCA simulation. The approximations used in the static model of MscS (fixed protein and lipids, implicit solvent) permit one to reach simulation time scales of hundreds of nanoseconds. However, many details are dropped and one may wonder how important those details are. Therefore, all-atom molecular dynamics simulations were performed to test the validity of the previous results. In order to obtain meaningful results using the more expensive all-atom model, large voltages had to be applied, and only short trajectories (tens of nanoseconds) could be monitored. Ions were therefore rushed through the transmembrane pore of MscS by applying large electrostatic potentials. 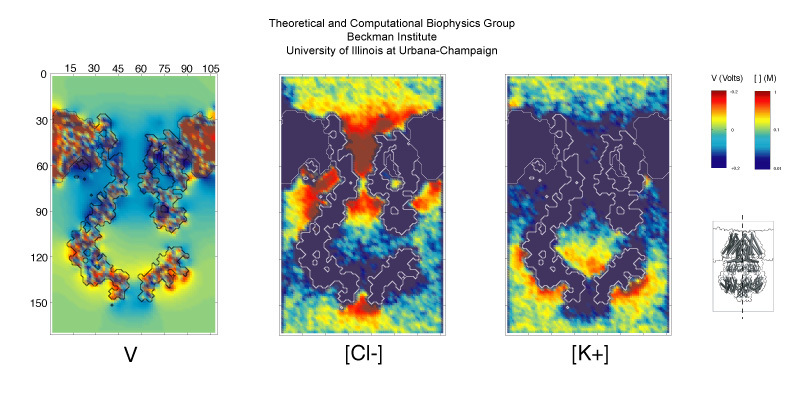 The electrostatic potential maps depicted in Fig. 7 confirm that we are applying the right potentials. The biased, all-atom simulations revealed that MscS in its crystal conformation (1MXM/2OAU) poorly conducts negative ions, while a wider state obtained upon application of biases exhibits a conductance that matches the experimentally observed values. All the open states tested feature straightened TM3 helices. Fig. 7. The electrostatic potential computed using the particle mesh Ewald method, averaged over 2 trajectories (10 nanoseconds each) at 0.6 V (middle) and 0 V (right). Click here for a movie (mpeg, 13.5M) showing a two-dimensional slice through the simulation cell during 12 ns of restrained MscS dynamics with an applied bias of 1.2 V.
Click here for a movie (mpeg, 8.2M) showing ion translocation through the restrained MscS pore during 12 ns of dynamics with an applied bias of 1.2 V.
Click here for a movie (mpeg, 8.8M) showing ion translocation through the unrestrained MscS pore during 10 ns of dynamics with an applied bias of 1.2 V.
Fig. 8. EPR based refinement of closed MscS. The simulations of MscS in its native-like environment revealed that the first MscS crystal conformation (1MXM/2OAU) does not represent a stable open or closed state. Likely, the structure is distorted by crystallization conditions: much like a pudding baked without an appropriate container, MscS crystallized without the membrane is out of shape. In order to solve this problem, one can use electron paramagnetic resonance (EPR) measurements on MscS spin-labeled cysteine mutants. The EPR data is obtained from closed channels that are embedded in a controlled membrane environment, thus decreasing artifacts arising from the absence of a lipid bilayer observed in other experimental setups. The EPR spectra is used to determine whether a particular residue is facing a membrane or aqueous environment, located at the interface between the membrane and the solvent, or buried inside the protein. Molecular dynamics simulations are then used to incorporate the information provided by the EPR experiments into a symmetrized model of MscS. First, pseudo-atoms representing the spin labels utilized in EPR experiments are assigned to each amino-acid of the structure (see Fig. 8). Second, the interactions between these pseudo-atoms and additional particles representing the membrane or the solvent are assigned for each residue. The assignment is done by taking into account the EPR data: pseudo-atoms of amino-acids exposed to aqueous environments (according to experiments) are set to interact favorably (in the simulation) with particles representing the solvent, while pseudo-atoms of amino-acids exposed to a membrane environment are set to interact favorably with particles representing the membrane, and pseudo-atoms of buried amino-acids are set to repel solvent and membrane particles. Finally, a molecular dynamics simulation is performed in which the pseudo atoms guide a dynamic refinement of the structure. The model of the MscS closed state is similar to the first MscS crystal structure (1MXM/2OAU) but with significant differences. The overall architecture is more compact and TM3 helices pack more tightly against the rest of the protein. The model also includes the previously unresolved N-terminus. To determine the architecture of the MscS open state in its native environment, the channel reconstituted in liposomes was subjected to EPR measurements after addition of LPC (cone-shaped amphiphiles that stabilize the open conformation of MscL and MscS). Modeling that incorporates the new EPR data obtained for the open conformation (in the form of helix rotations and accessibility restraints) resulted in tilting of TM1-TM2 helices and a wider channel that likely represent a fully open conformation of MscS in situ. Fig. 9. A structural mechanism for MscS gating. The cytoplasmic domain (CD) (Fig. 10) of the MscS comprises ~65% of the total mass of the protein and is a conserved structural feature in the MscS family whose function remains unclear. The CD (shown in movie 1 ) is mainly composed of β -sheets that form a balloon-shaped, water-filled chamber with a diameter of ~80 Å . The CD has seven distinct, roughly hourglass-shaped side openings, each ~7 Å wide in the middle, formed between adjacent MscS subunits and has a narrow axial opening distal to the pore. The side openings are lined by side chains that are basic, acidic, polar, and nonpolar, thus suggesting only weak selectivity, if any regard to solutes allowed to pass through. The narrow distal opening has its interior lined with hydrophobic residues which prevent passage of hydrated solutes, such that this opening appears to be effectively closed. The CD is a conspicuous component of the mechanosensitive channel, MscS. It is not directly involved in the protein's TM channel. Yet, it makes up the major body of the protein. Given the CD's sievelike and mixing bowl-like architechture along with its cytoplasmic position, a filter and mixer function suggests itself and has been investigated. In our study of MscS' filter and mixing function, we select two osmolytes for particular attention, namely, Glu- and K+. We consider Glu- and K+ as exemplary cytoplasmic solutes that shed light on MscS' function in general due to their high concentration in E. coli cells. We demonstrate theoretically and computationally CD's action as an filter based solely on overall translocation behavior of the two osmolytes. Fig. 10. Side view of the MscS (PDB:2OAU) showing the transmembrane and the cytoplasmic domains. The cytoplasmic domain contains seven equal openings on its side, one of which is enlarged, exhibiting the 7 Å opening with side groups lining the opening in licorice representation (colors gray, green, red, and blue denoting nonpolar, polar, negative and positive side groups respectively) (also see movie 1). The CD side openings are the only gateway for water and cytoplasmic solutes to reach the cell exterior. Translocation of solutes involves three steps as shown in Fig.11: 1) diffusion of solutes towards the CD requiring a time τ1 to find a side opening; 2) passage of solutes through an opening requiring a time τ2; and finally 3) translocation through the TM pore to the cell exterior requiring a time τ3. Fig. 11. A schematic illustration of MscS and the passage of cellular material from the cytoplasm to the extracellular space upon opening of the channel due to an osmotic pressure difference. D is the diffusion coefficient of solute in water, RL is the Onsager radius= 49 Å , R0 radius of the CD =43 Å, and q0 =0.02 is the fractional surface area of a side-opening. Employing the stated values for Glu-, on an average, aprroximately one Glu- per 32 ns enters a CD opening. We note that if the entire CD would be porous for Glu-, the average time τ1 of reaching the pores would be 50 times shorter than without the filter function of the CD openings. Clearly, the CD acts as an entropic filter, turning randomly a large fraction of approaching Glu- away, preventing, thereby, a quick loss of Glu-. For K+ the electrostatic potential around the CD is attractive. One can assume that, once the ion has reached the CD surface, the quantum yield of finding a pore opening is close to one as K+ remains attracted to the surface long enough to eventually find an opening. Thus assuming the search time of K+ is negligible, one obtains τ1~0.045 ns for K+. Fig. 12. Free energy profile for Glu-, a key cellular osmolyte, translocating a side opening in the MscS cytoplasmic domain (also see movie 2). The integration limits x1 and x0 correspond to the ion set at an initial position outside the CD, x1 , and reaching the center of the CD, x0. D is the diffusion coefficient of the ion in water. Numerical integration of the expression yields τ2 ~ 40 ns for Glu- and 20 ns for K+ ion. The stated τ2 values for Glu- and K+ suggest that both ions permeate the CD openings quickly. In the above expression, Ũ(x) = U(x)-kBT ln Z(x) combines enthalpic [U(x)] and entropic [-kBT ln Z(x)] contributions. U(x) is the transmembrane potential characterized through the resting potential of the E. coli, namely, V0 = -100mV; Z(x) accounts for the CD geometry along the conduction path CD to channel. The integration limits xapex , xcenter , xout are positions along the CD axis located at the CD apex, CD center, and end-point of the transmembrane channel. The exit times, τ3, are shorter in the case of Glu- and longer in the case of K+. Fig. 13. Diffusion of Glu- and K+ ions through the cytoplasmic domain of MscS. The MscS' CD acts as a filter. The role of a filter is such that it promotes valuable solutes to pass through the openings quickly without clogging the openings, but the solutes donot reach the openings in the first place. Clogging of the CD openings is investigated through calculation of mean passage time τ2 for the two solutes, Glu- and K+ making it through the openings, which was evaluated from PMF obtained through simulations: τ2 turned out to be much shorter than typical open times of MscS, which implies CD openings remain unclogged as regards to the two solutes. We note that the cell potential of ~-100 mV tends to expel Glu- from the cell and retain K+ and therefore the channel exit times, τ3 is faster for negative Glu- than for the K+. From the translocation times τ1, τ2, τ3 for Glu- and K+, we conclude the filter function of the CD as shown in Fig. 13. The overal exit time τ is ~55 ns for K+, is close to the 80 ns Glu- value, but τ1 is shorter and τ3 is longer than for Glu-. Mscs, through the combination of CD and channel, manages an amazing feat namely even though the cell potential by itself clearly favors expulsion of Glu-, compensation through a short K+ τ1 makes the overall exit times, τ, of Glu- and K+ about the same. This balance is likely stablized through electrostatic interactions in the CD. The size of the CD with an inside opening volume, permits at any one time ~ 10 positive and ~ 10 negative ions, for the given ion concentration of 0.2 mol/L. In addition, we derive that lowest electrostatic energy is assumed when the CD harbors the same number of positive and negative ions. This scenario suggests the CD is designed to prevent dominant efflux of negative ions. e.g., Glu-, an efflux which is favored by cellular potential, and instead appears to maintain, by mixing equal amounts of Glu- and K+ ions or other anions and cations, neutral efflux that conserves the cellular potential. Cytoplasmic domain filter function in the mechanosensitive channel of small conductance. Ramya Gamini, Marcos Sotomayor, Christophe Chipot, and Klaus Schulten. Biophysical Journal, 101:80-89, 2011. A structural mechanism for MscS gating in lipid bilayers. Valeria Vasquez, Marcos Sotomayor, Julio Cordero-Morales, Klaus Schulten, and Eduardo Perozo. Science, 321:1210-1214, 2008. Three dimensional architecture of membrane-embedded MscS in the closed conformation. Valeria Vasquez, Marcos Sotomayor, D. Marien Cortes, Benoit Roux, Klaus Schulten, and Eduardo Perozo. Journal of Molecular Biology, 378:55-70, 2008. Ion conduction through MscS as determined by electrophysiology and simulation. Marcos Sotomayor, Valeria Vasquez, Eduardo Perozo, and Klaus Schulten. Biophysical Journal, 92:886-902, 2007. Electrostatic properties of the mechanosensitive channel of small conductance MscS. Marcos Sotomayor, Trudy A. van der Straaten, Umberto Ravaioli, and Klaus Schulten. 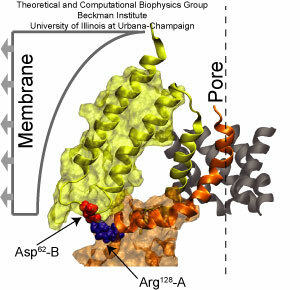 Biophysical Journal, 90:3496-3510, 2006. 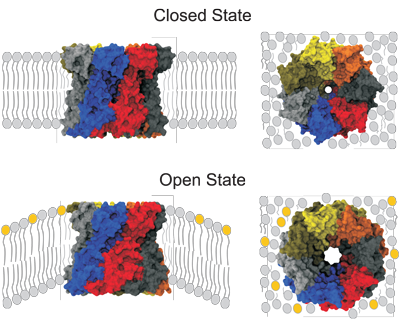 Towards understanding membrane channels. Emad Tajkhorshid, Jordi Cohen, Aleksij Aksimentiev, Marcos Sotomayor, and Klaus Schulten. In Boris Martinac and Andrzej Kubalski, editors, Bacterial ion channels and their eukaryotic homologues, pp. 153-190. ASM Press, Washington, DC, 2005. 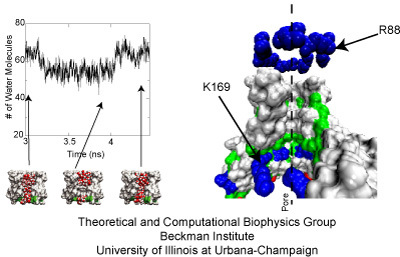 Molecular dynamics study of gating in the mechanosensitive channel of small conductance MscS. Marcos Sotomayor and Klaus Schulten. Biophysical Journal, 87:3050-3065, 2004. Our work was also featured as a success story for computing at the National Center for Supercomputing Applications. Page created and maintained by Ramya Gamini. Contact Us // Material on this page is copyrighted; contact Webmaster for more information. // Document last modified on 02 Oct 2013 // 30220 accesses since 08 Apr 2006 .